1. Contamination of groundwater aquifers with drilling fluids or natural gas while drilling and setting casing through the shallow zones. The report says that this risk should be effectively controlled: “good oilfield practice, governed by existing regulations, should provide an adequate level of protection from these problems.” It recomments that an interstate regulatory review should be done of existing regulations to recommend best practices for regulation of drilling and high-volume hydraulic fracturing. Note that the report does not recommend federal regulation of hydraulic fracturing under the Clean Water Act. 2. On-site surface spills of drilling fluids, frature fluids and wastewater from fracture flowbacks. The report also says that these risks can be managed by state regulations. It recommends complete disclosure of all fracture fluid components and continuation of efforts to eliminate toxic components of fracture fluids. 3. Contamination as a result of inappropriate off-site wastewater disposal. The report notes that every year the onshore U.S. industry safely disposes of 18 billion barrels of produced water. 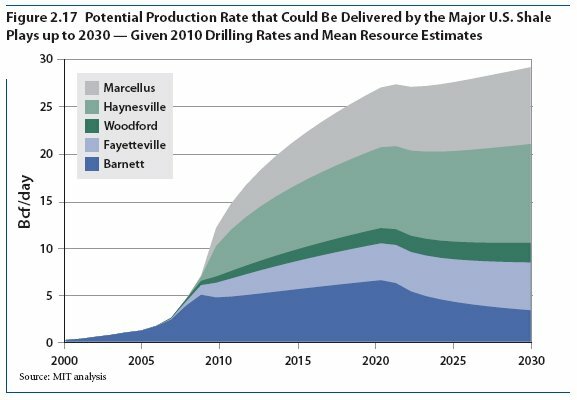 “By comparison, a high-volume shale fracturing operation may return around 50 thousand barrels of fracture fluid and formation water to the surface.” It recommends improvements in the recycling of frac water and the development of effective processes to clean up the frac water so that it becomes potable. 4. Excessive water withdrawals for use in high-volume fracturing. 5. Excessive road traffic and impact on air quaility. The fracturing process itself poses minimal risk to the shallow groundwater zones that may exist in the upper portion of the wellbore. As described previously, multiple layers of cement and casing protect the freshwater zones as the fracture fluid is pumped from the surface down into the shale formation. This protection is tested at high pressures before the fracturing fluids are pumped downhole. Once the fracturing process is underway, the large vertical separation between the shale sections being fractured and the shallow zones prevents the growth of fractures from the shale formation into shallow groundwater zones. … The physical realities of the fracturing process, combined with the lack of reports from the many wells to date of fracture fluid contamination of groundwater, supports the assertion that fracturing itself does not create envionmental concerns. In conclusion, it is clear that oil and gas development is not without risk to the natural environment. State and Federal regulations are designed to mitigate those risks. However, though not the result of risks inherent to the fracturing of shale gas wells, operational errors and poor drilling practice do result in a significant number of incidents. Implementation of the recommendations described above, together with rigorous enforcement of all applicable regulations, should reduce the number of incidents and ensure that shale development can proceed with minimum impact on the environment. Comforting words for those in the gas exploration business. 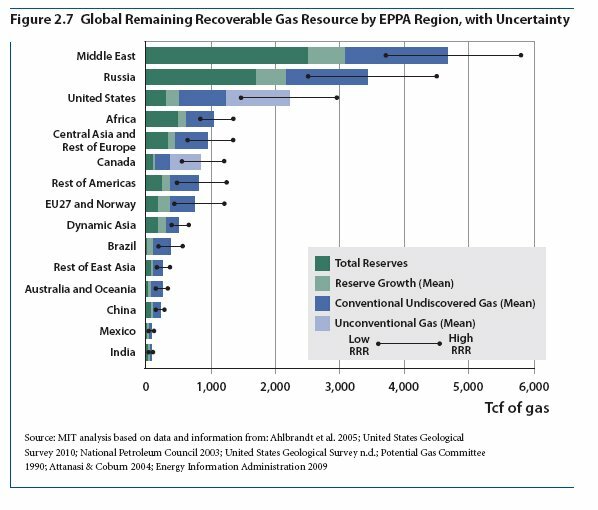 This report necessarily is looking at the gas exploration industry from the 40,000-foot big-picture perspective, and it cannot address particular concerns in particular regions being developed. For example, the Eagle Ford shale is in West Texas, and in parts of that play groundwater may be scarce and using groundwater for fracking could have a significant impact on groundwater resources. And in Pennsylvania, where infrastructure for underground injection of frac water does not exist, the potential for contamination of surface water resources from returned frac water is greater than in Texas. 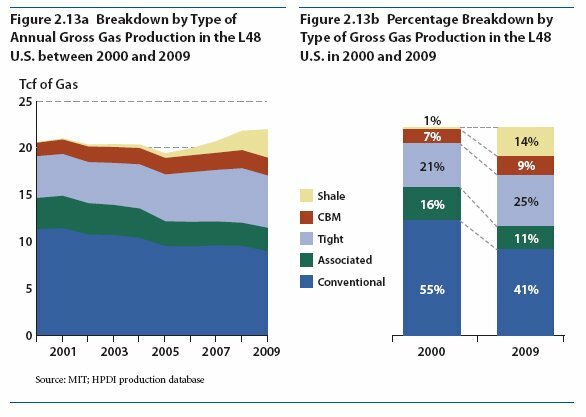 But, overall, the conclusions of the MIT study appear to me to be reasonable, and make the promise of natural gas as a bridge fuel for the future, with minimal environmental risk, more believable.